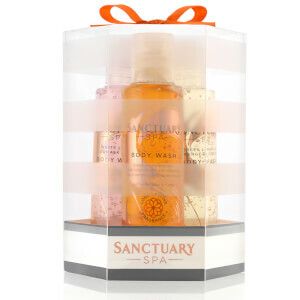 Treat yourself to the Sanctuary Spa Spend More Time Being Gift Set. Combining five luxury skincare products, the collection allows you to pamper and nurture your skin while enjoying their long-lasting, sensual fragrance. A silky, nourishing body lotion enriched with a skin-quenching blend of Aloe Vera and Argan Oil. Lightweight and hydrating, the body treatment melts quickly into skin, delivering nurturing and moisturising properties to leave the body feeling soothed, replenished and hydrated. 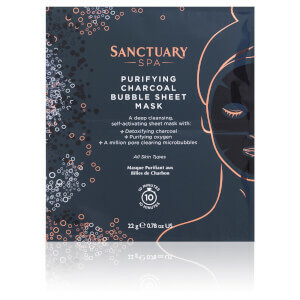 A decadent bubble bath infused with a luxurious cocktail of Baobab, Vitamin E and Freesia Flowers. Delivering a skin-softening effect, the pampering bath soak will leave the body feeling nourished, pampered and delicately perfumed with an oriental fragrance. Body Lotion: Massage generously into skin. Warning: Do not use on face. Avoid contact with eyes. If the product gets into eyes, rinse well with warm water immediately. Bath Soak: Pour generously under warm running water. Sink in and enjoy. Warning: Do not use on face. Avoid contact with eyes. If the product gets into eyes, rinse well with warm water immediately. Body Lotion: Aqua (Water), Glycerin, Butyrospermum Parkii (Shea) Butter, Para num Liquidum (Mineral Oil), Cetyl Alcohol, Cyclopentasiloxane, Dimethicone, Glyceryl Stearate, PEG-100 Stearate, Phenoxyethanol, Parfum (Fragrance), Carbomer, Chlorphenesin, Sodium Stearoyl Glutamate, Sodium Hydroxide, Benzophenone-4, Disodium EDTA, Aloe Barbadensis Leaf Juice, Argania Spinosa (Argan) Kernel Oil, Sesamum Indicum (Sesame) Seed Oil, Hexyl Cinnamal, Linalool, Limonene, Benzyl Salicylate, Benzyl Benzoate, Coumarin, CI 15985 (Yellow 6), CI 19140 (Yellow 5). Bath Soak: Aqua (Water), Sodium Laureth Sulfate, Caprylyl/Capryl Glucoside, Cocamidopropyl Betaine, Sodium Chloride, Parfum (Fragrance), Phenoxyethanol, Sodium Benzoate, Citric Acid, PEG-250 Distearate, PEG-40 Hydrogenated Castor Oil, Polyquaternium-10, BHT, Tetrasodium Glutamate Diacetate, Butyl Methoxydibenzoylmethane, Tocopheryl Acetate, Sodium Hydroxide, Saccharide Isomerate, Propylene Glycol, Hydrolyzed Adansonia Digitata Extract, Freesia Refracta Extract, Carbomer, Hexyl Cinnamal, Linalool, Limonene, Benzyl Salicylate, Benzyl Benzoate, CI 15985 (Yellow 6), CI 14700 (Red 4), CI 19140 (Yellow 5).